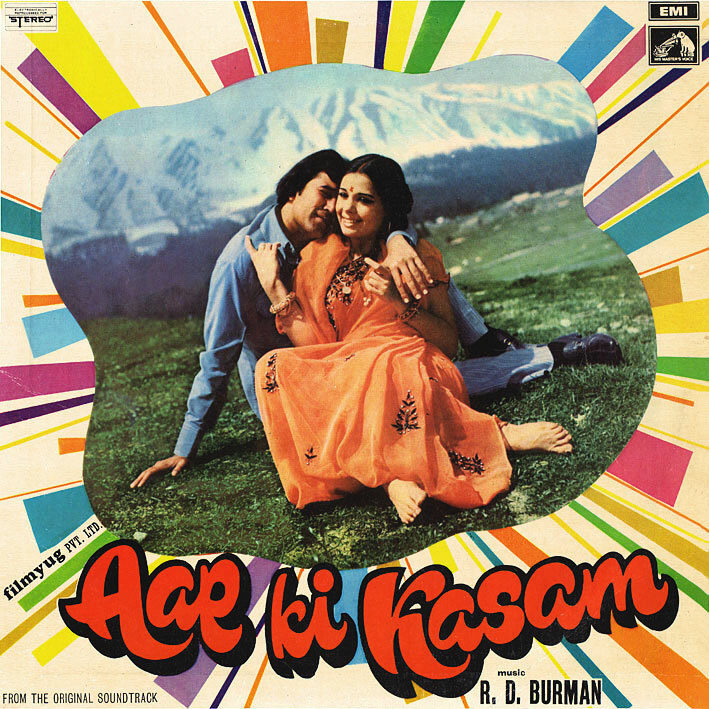 Here's one I think is ace: It's hard to define though, just why I like 'Aap Ki Kasam' a lot, and not 'Mere Jeevan Saathi' (below) so much... maybe it's just a subjective thing, how you respond differently to different music. Or perhaps it's the quality of the songs? Because on this, they're top notch: 'Suno Kaho, Suna Kaha' has a great melody, chirpy as spring, sounds like it could have been on 'Yaadon Ki Baaraat'. 'Jai Jai Shiv Shankar' tends to have me bouncing about the floor with its percussion drive and catchy tune. 'Chori Chori Chupke Chupke' features Lata Mangeshkar duetting with a sitar, interspersed with subtle strings. And the three others, all on the likeable side. Recommended! Wow - great soundtrack and one that I also own on vinyl! Hearing your version has cleared something up that has been bugging me for ages. In the 'Chori Chori Chupke Chupke' song (which is my fave from this album) there is a significant jump (at about 2mins 46s). I always wondered if it was my version of the record or if it is a mastering fault. Well I guess this is hpw the records were pressed. I never got the CD of it - my guess is that it is the same. Anyway - really great album - with a great RD Burman feel to it. Thanks! Been looking for this one! Thanks for posting this great RD BURMAN album. thanks for the latest offering. Great album my favourite is especially "karvatain Badalte Rahe it has great video to it with Mumtaz and Rajesh in the snow. Bugger, that's not good... seems as if easy-share are having some problems (I've had trouble uploading files as well), so what I'm going to do is wait a couple of days to see if they sort it out, and if not I'll find an alternate/mirror host. Thanks for your response Still trying it failed again ! i say stick with the easy share because for me it's best in the sense that you don't have to wait for all those country slots to open and in easy share's case you don't have to wait for your downloads.i have being downloading from your site the old posts and the new ones with out any problems from easy share. Right, so I've tried downloading a random selection of albums (incl. this one + the compilation which is larger than the rest) on 2 different computers... and there were no problems at all. That, plus the fact that a lot of people are actually getting these, tells me that the problem may be due to unstable connections at the recipients end, more so than Easy-Share... I've that happen to me before anyway. I'm not saying Easy-Share is perfect because there's been some strange behaviour at times... but that's the case with all the other hosts I've used as well - some (Rapidshare and Megaupload) to the point that I'm not using them anymore. So, for the time being anyway, I'm staying where I am. It does however bother me that a few people wanting the albums aren't getting them... so if the problems persist, email me (address under my profile) and I'll sort some mirror or something out. hello! this one is very good. i love UPKAR soundtrack and wanna ask u if can rip it in 192 kbps and re-upload? that will be wonderful. Ah... so it isn't just my imagination!! It did sound different. Btw many thanks for 192 rips. The enthusiasm in your comments makes it all the more devastating that the link no longer works. Could you possibly re-post? Thank you for all the hard work you've already put into this project. It is GREATLY appreciated. The link above still works.